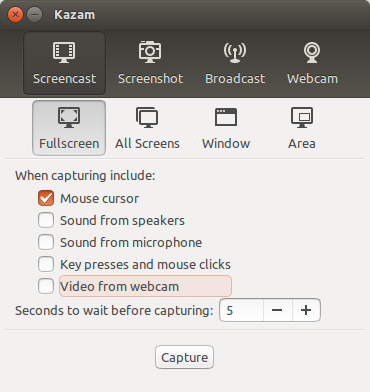 Them main reason I want Kazam 1.5.3 exactly is because it comes with a webcam option. But now, when I execute the previous commands, it only installs the previous version (Kazam 1.4), which doesn't come with a webcam option. Is there a way to get the latest version? Kazam is available in the official Ubuntu repositories, but it's an old version (1.4) and ppa:kazam-team/unstable-series has not been updated for 16.04 (and does not include debian patches). cd to /etc/apt/sources.d/ open up the kazam.list file and make sure you change repo to devel. Not the answer you're looking for? Browse other questions tagged webcam screencast kazam or ask your own question. How to record the screen and webcam at the same time? Low Quality Screencast with kazam and recordmydesktop? How to adjust the bitrate Kazam?